Families share almost everything, but there are plenty of times when you and your family members need to make sure you know which items belong to what person. Whether it’s your daughter’s favorite sweater, your twins’ hockey jerseys or your mother’s handbag, having your family’s belongings clearly labeled can help cut down on arguments – so your loved ones don’t lose the items you gave them when they left the house. The bigger your family is, the more possessions you have. That means, more opportunities for confusion. That’s why It’s Mine! Labels helps organize your family with labels and name tags for virtually any need you have. Here’s a quick rundown of how we can help get your family organized. Kids need so many items, but they’re not always the best at keeping track of them all. Between school, sports and activities, children are always on the go. It’s Mine! Labels can help your kids keep tabs on their coats, jackets, lunchboxes, sporting equipment, etc. – with attractive, durable labels that let anyone know at a glance to whom it belongs. With our wide assortment of stick-on, iron-on and sew-in kids’ labels, your children will be much more likely to bring back everything they take with them to school, day camp or any other excursion. Whether seniors live independently or in assisted care, it can be difficult for them at times to keep track of their belongings. However, labels from It’s Mine! 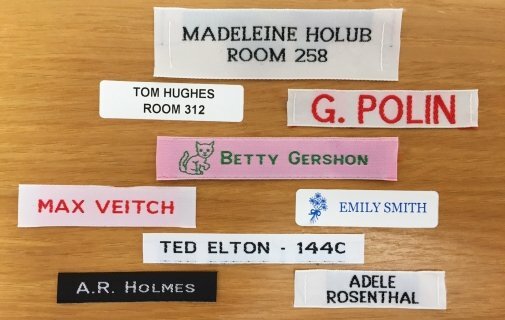 Labels can help seniors prevent losing their clothing and other belongings, or mislaying them in a communal living setting. With our durable and versatile labels, you can rest assured that your loved ones will have their cherished possessions near them at all times. Whether you’re a crafter or just someone who needs to keep your closet organized, It’s Mine! Labels has a solution to help you. With customizable stick-on labels, iron-on labels and sew-in labels, we can provide name tags and labels that will stand up to whatever your belongings go through during your busy everyday life. What’s more, our labels will ensure that you and everyone else will always know which items are yours. If your family could use some help getting organized, check out everything It’s Mine! Labels has to offer and learn how we can help you.